If you are new to scouting you will be exposed to "Scoutspeak". Here is a handy guide to help you learn the language of Scouting. 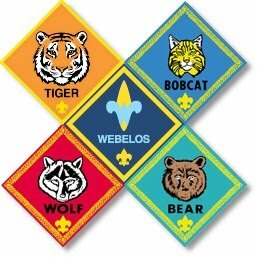 Tiger, Wolf, and Bear Cub Scouts must complete Adventures as described in their rank handbook. Some adventures are required for rank advancement; others are "electives" which are chosen by the Scout. Each Adventure earns a nifty metal loop that can be worn on the uniform belt. Awarded to Webelos Scouts who complete adventures in their rank handbook. Some pins are required for earning the Webelos rank, and other are required for earning the Arrow of Light award. Still others are elective and can be earned if the Scout chooses to complete them. Generally held in February to celebrate the anniversary of Cub Scouting. This celebration can be an annual pot luck dinner, banquet or whatever the pack decides to make it. Our Pack usually awards rank badges in a special ceremony at this event. A Scouting magazine for boys to help broaden their horizons in Scouting. Jam-packed with action, adventure, games, puzzles, and tons of reading fun for Cub Scouts! The Boy Scouts of America is a nationally chartered organization that encompasses Cub Scouts, Boy Scouts, and Venture Crews. One part of the Safe Swim Defense. Swimmers of like ability are paired. Check in and out of the water together and stay within 10 feet of each other during the swim. It is also used on other Cub Scout activities, such as Hiking, for safety reasons. Formal permission from the Boy Scouts of America allowing the formation of a Pack. An adult representative of the group or organization that currently holds the BSA charters. Acts as a liaison between the Pack and the chartered organization. This is a group of adult volunteers who “run” the pack. Positions include the treasurer, trainer, awards coordinator, among others. Any interested adult is welcome to attend Committee meetings, whether they hold a position or are just interested in pack operations. The adult leader of the pack committee. Provides the motivation and direction to the committee to get the pack program implemented. Our Committee Chair is Robert Sutton. A geographical area, made of up districts for administration of the Boy Scout programs. We are part of the Westark Area Council. Any of a million or so boys between the ages of 6 and 11 who gets together with his fellow Scouts and has fun at Den and Pack meetings. Marked by curiosity, easy laughter, speed, and blue uniform. Likes to consume s'mores and Bug Juice. The Cubmaster is the chief adult volunteer leader. The Cubmaster runs the pack meetings and advises other leaders. Our awesome Cubmaster is Dave Weston. A group of 6-10 boys at the same grade/age/rank level who meet at regular intervals. A Boy Scout who helps direct the activities of a den. Volunteer adult, enjoys doing all kinds of stuff with boys, even if it involves large quantities of patience. Easily smiles, asks others for help, and uses all kinds of resources to keep smiling--like Roundtables. Each council is divided into a number of districts. Our district is the Cornerstone District, which includes all of Benton County. Scouts' guide through their new rank handbooks. Program for new leaders to help them until they can attend CSLBT. International Boy Scout Emblem. Also used by a New Orleans football team. Some Scouters even have boxer shorts with this on them. A form of cheer, along with Growls, Whoops, and the Disco Mosquito cheer; all done to show appreciation of Cub Scout skits and stunts in place of mundane old “PTA applause”. Young male goat. Or a smallish human being who loves to play, laugh, and learn. Good candidate for Cub Scouting. Person who gives an hour each week (maybe a little more!) to help boys grow to be young men of character. Sets example by giving back to the community. Semi-chaotic gathering of boys where much fun and some learning happens, usually helped along by Den Leaders and Grown-ups. The whole group – all or our dens and families together is called a Pack. The pack usually meets once a month. We are one big family! A pack racing competition, where Cubs and their parents work together to make model pinewood derby cars and compete for shiny, awesome trophies. Theoretical concept indicating the absence of all noises...unknown to Cub Scouting. Someone who may or may not have boys in Scouting, but just really loves the program and gets immense satisfaction from helping boys grow and learn. A first grader who is brand-new to the adventures of Scouting! Ready to explore and learn and look adorable in his orange neckerchief while he's at it! "We’ll Be Loyal Scouts". Also, boys in 4th and 5th grade. Sometimes wear the khaki Boy Scout uniform (usually means he outgrew the blue one). Works on Activity Pins, camps, goes on hikes, prepares to be a Boy Scout. Old hand at this Cub Scout business--can build a Pinewood Derby car blindfolded. Cub Scout in 2nd grade. Incredibly cute in blue uniform and new yellow neckerchief. Full of life and enthusiasm, eager to learn all about Cub Scouts.